Are you making a living or would you rather make a Life? Examine what possesses you to understand how impoverished your really are! All of us have been trained to calculate our net worth basis our material assets – property owned, gold lying unused in lockers, investments in stocks, insurance policies, vehicles, cash in the bank. If you think you have enough, all your thinking is focused on how can you protect your net worth, as viewed by you, from eroding and ensuring it actually appreciates in value. And if you think you want some more, and what you already have is not enough, all your thinking centers on amassing more assets – everything is about property, money, stock markets and investments. In either of these scenarios, you are being possessed by something you are not. And that makes you, very, very, very poor in Life’s scheme of things! The truth is you are not your bank balance, not the property you own, not all the assets that your accountants total up to declare your net worth. You are Life, the Universal energy, in its purest form, and you imagine that you are a few pieces of paper and metal or a few measures of this earth, that which you cannot take with you in any case, when this human form of yours dies! As long as you are possessed by what you think you own, you are not living. You merely exist. I met a friend recently, who, by his own admission, has plenty saved up in his bank accounts for his next two generations of family to exist comfortably. Yet, for several months, he confesses, he has been ‘grieving and suffering, often spending sleepless nights’, fighting to recover a sum of money owed to him by someone. Since that person has changed his address and is not traceable, a court order that my friend has secured stating that the party pay up cannot be served on the latter. My friend therefore has embarked on a pilgrimage to rid himself and his family’s path of all the obstacles that prevent them from recovering what’s due to them! In principle, there is nothing wrong in fighting legitimately for what is yours. There’s no harm in undertaking a pilgrimage too. But in either situation and effort if you are going to be ‘possessed’ by your desire to want the money desperately or by the fear that you may not ‘get what you want’, then are you not a slave? Of what use is all your wealth if at the end of the day you are enslaved by what you think you possess? Do what you think you must do to earn your incomes, protect your wealth and grow your asset bases. Just don’t get possessed by your material wealth. 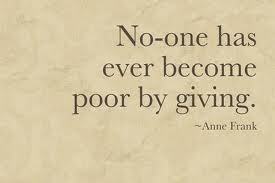 In Life’s book, net worth is judged not by how much you have, but how much you give. 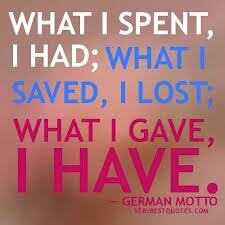 Give freely. Give food to the hungry, give clothes to the homeless and cold people this winter, give your time and attention to your family that perhaps doesn’t nag but pines for you, give your love and compassion to a harassed colleague at work or give a helping hand to a stranger struggling to cross the road or load heavy bags on to a cart at the airport. Give without expectation __and you will feel you have gained something. You will feel enriched. You will realize this simple truism about Life – that when you give, you rejoice, you exult, you feel happy and blessed. When you want, you feel tormented, depressed, fearful and always unhappy! In reality also, all that you want can be robbed from you __ Life can take away your power, position, prestige, money and all your material assets. But no one, not even Life, can take away what you can give, unless you want to give it yourself. Like your love or your time that you choose to give someone – without any expectations of anything in return. Think about it! Making a difference to someone’s Life can enrich you. Just making money for yourself actually impoverishes you! It is the difference between making a Life and making a living! Author AVIS ViswanathanPosted on December 19, 2012 March 14, 2016 Categories Art of Living, Bliss, Giving, Intelligent Living, Joy, Life, Poor, Possession, Rich, SufferingLeave a comment on Are you making a living or would you rather make a Life?